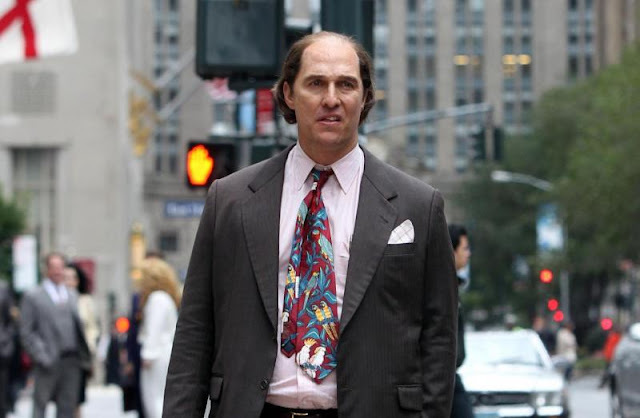 Matthew McConaughey sports a pot belly and bald head to portray Kenny Wells, half of a goldmining team that hits the jackpot in Indonesia in this morality play loosely based on the Bre-X scandal of 1993. Performances by him and his partner in business, Édgar Ramírez (as Michael Acosta), and love, Bryce Dallas Howard (as Kay) are sound, but we never quite fall behind Wells and cheer him as he strikes it rich nor pity him as he slides down. Another missed opportunity is Howard, whose Kay remains underdeveloped throughout and relationship with Kenny doesn't payoff at the end. It doesn't help that Gold film takes a long time to establish in the first half-hour, belatedly building to the jackpot moment. Similarly, the resolution (no spoilers here) unnecessarily takes too many detours and saps the ending of its power. The film ends on a whimper. A judicious editor with a large pair of scissors would have boosted the narrative immeasurably. The story itself is intriguing. The message of greed, though nothing new, is certainly appropriate. What's missing is a director to milk moments of achievement (i.e. discovering the gold and getting rich) with euphoria and giddiness. Think of American Hustle or most Scorsese gangster pictures and how those anti-heroes wallow in shameless materialism then suffer for their hubris. Those high notes are missing from Gold. Entertaining in places, though overall not memorable. Wait for this one to hit Netflix. film review (Netflix): Miss Sharon Jones!